For nearly 30 years, the people of Sri Lanka endured a devastating civil war that left many destructive and dehumanizing consequences. In response to this devastation, the Missionary Oblates have created a peace education program to bring reconciliation and hope to the troubled nation. “We decided to launch a program of higher education that would train peace activists with the specific objective of creating a new nation where people would transcend language, religious, cultural and ethnic bias and work in harmony to foster freedom, democracy and justice in a country battered, bruised and divided by civil war,” said Fr. Oswald Firth, O.M.I. Director of the Oblate Institute of Higher Learning (OIHL). 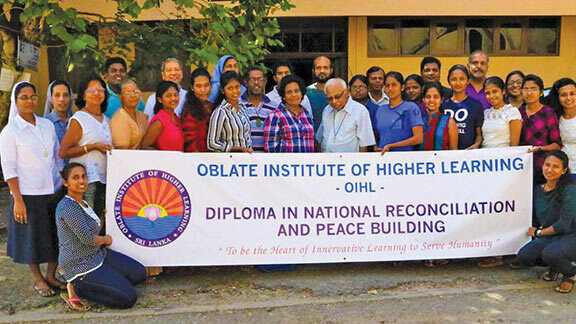 OIHL offers a diploma in National Reconciliation and Peacebuilding which includes theoretical knowledge and practical know-how on ways to build peace. Participants spend a year inside and outside of the classroom exploring issues such as conflict transformation, social engagement, psychological counseling and inter-religious dialogue. Field work for the students included working in areas that were particularly affected by the violence of the civil war. Under the direction of experienced animators, the students are given new insights into the root causes and consequences of conflict and war in Sri Lanka. “Participants become well-trained advocates of peace promotion and reconciliation, fighting against racial and religious bias when and wherever these elements raise their ugly heads to disrupt the peace,” said Fr. Eric Wasalathjanthri, O.M.I., Academic Secretary at OILH. The Missionary Oblates have been ministering in Sri Lanka since 1847. Much of their work has focused on education, opening schools from primary to university levels in underserved communities. People of all faiths are enrolled at these Oblate schools, a rarity in a deeply-segregated country. In 2016 the Oblates celebrated their 200th Anniversary as a congregation. In Sri Lanka the Oblates decided they needed to create a bold initiative in light of their bi-centenary of missionary work. The peace studies program was developed and the first graduates of the program received their diplomas in the Fall of 2017.